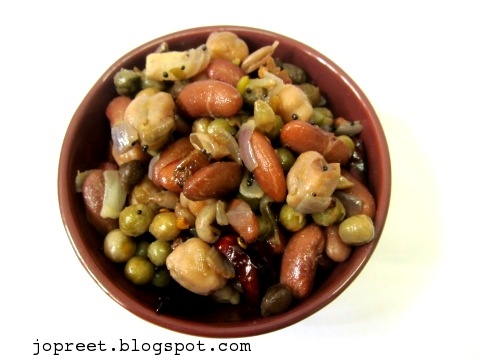 Pressure cook dried green peas, green chick peas, white chick peas and red kidney beans with 1 cup water for 5-6 whistles. 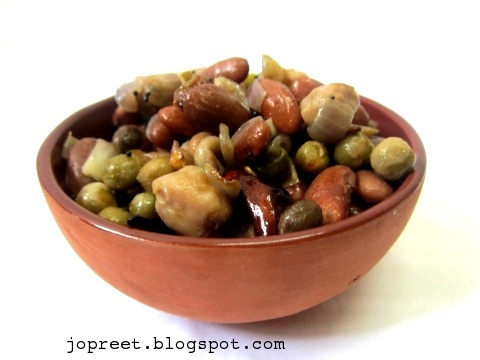 Drain the water and keep the cooked channa aside. Heat oil in a kadhai and temper mustard seeds. Add curry leaves, broken red chilies and urad dal. Saute a while. Add chopped onions and fry for 2 mins. Add cooked channa, asofoetida and salt to taste. Fry for 5-10 mins and remove from the heat. Serve hot. You can also add grated coconut to it. oh.. healthy sundal!.. looks very good!! All mixed sundal. Each one will give diff taste. Yummy.